Moms make the world go round. We birth our babies, we teach our tots, we nurture them and look out for their health. Our job is never done. From kissing boo-boos to gut healing, we do it all. Along with my sons ASD diagnosis he had many gut problems. My sister, who is on an amazing health journey herself, introduced me to fermented food and probiotics. By definition they are foods that have been through the process of lacto fermentation, which is where bacteria feed on sugar and starch in the food. In a nut shell, its a food preserving process that creates really good enzymes, omega-3 fatty acids, and of course the star of the show, PROBIOTICS! She would explain to me the differences between good and bad bacteria, that all disease starts in the gut, and how candida can affect your emotions and behaviors, gut Health 101. It all made so much sense for myself and my child. I was totally on board, bring on the Kraut! We live in different states and she would be so generous in overnighting me such great packages full of homemade fermented foods. You name it, she fermented it. She told me how easy it is to make, I thought it was her subtle way of saying “dude make it yourself”. Little did I know it really was that easy. One day my package got damaged and lost, good ol’ USPS or divine intervention. Whatever the case I literally was forced to give it a go and make my own fermented foods. By this time we were all hooked on the stuff, and my sons gut flora seemed to be on an incline. His bowel movements were frequent and regular, bloating & tantrums were gone, and his eczema was going away. I needed this stuff. WE needed this stuff. So I purchased my own kefir starters and cultured veggie kits. I was ready! How I got my very picky eaters to even try these foods is a whole notha blog, Lord knows it wasn’t easy. However, Around the time I started eating fermented foods, I started my kids on the GAPs diet. There were so many staples I eliminated from my kid’s diet, and dairy was one of them. 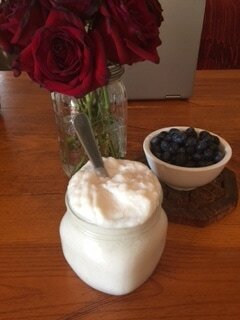 I saw an opportunity to make a yogurt like replacement that was fermented, so of course I wanted to give it a go! So #ALLYOUGOTTADO is open up all your coconuts, the more the merrier. Pour all Coconut liquid in a separate bowl. Scrape out all coconut meat. Blend meat, 1 cup of coconut water, and 1 packet of kefir starter. The amount of coconut water needed will depend on how much coconut meat you have. You want a pudding like consistency. Pour your mix into jars. Through the process of fermentation, the yogurt will expand so don’t fill to the top. I stop a couple inches from the top. Place your jars in a temperature steady environment (73-75 degrees). Leave for 4-6 days, then refrigerate. You can enjoy this goodness at any stage. The yogurt will separate, and that’s a good sign that the fermentation process is working! All you gotta do now is run up a flight of stairs (3-4 will do), perform a series of rocky like punches and shout “the champ is here”! You did it. 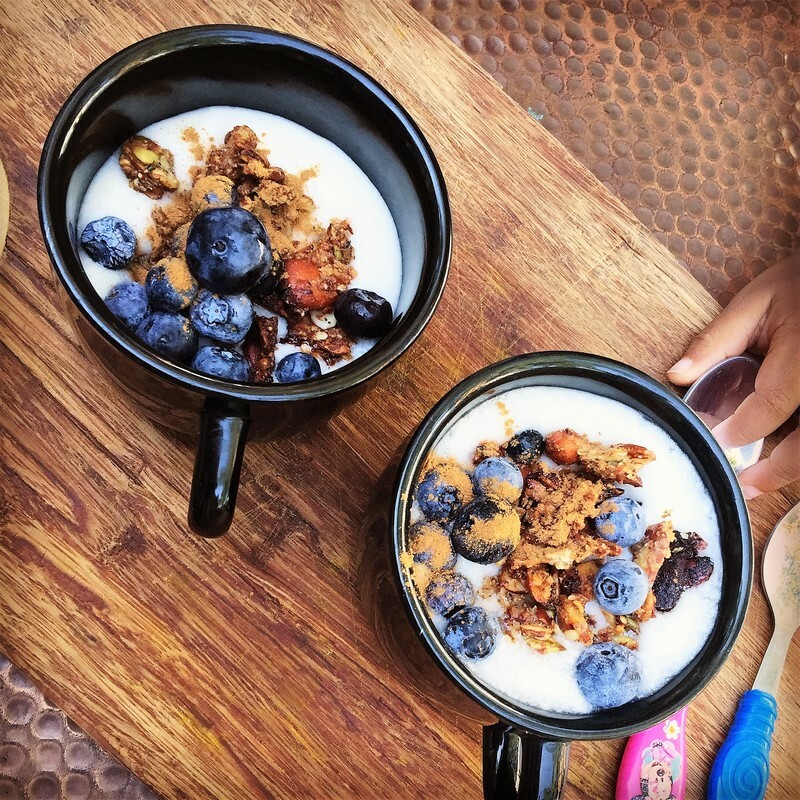 Bring on the healthy gut flora!